Clear Spider provides you with all the tools you need to effectively manage your small business inventory. Our clients choose Clear Spider over any other system because of the power and flexibility it has to accommodate any complexity or type of inventory management needs. We give our small business clients all the features they need to do basic inventory management. We also offer functionality add-ons so the system can grow with your organization. We offer small businesses all the functionality they need to effectively manage their inventory. Manage orders and shipments on our simple and easy-to-use platform. Since our system is cloud-based, you have access to real-time updates and can create orders from anywhere. Re-gain complete control over your consignment stock that is stored at customer locations. Clear Spider acts as a liaison between the two parties and provides visibility. At Clear Spider we understand that each of our clients have a process flow that is unique to their organization. This is why we customize our systems workflow to mirror individual organizations’ needs. Reports and Analytics help organizations make the most out of their inventory. Reports and analytics can be used to make business decisions, increase productivity, and recognize trends. Set up multiple locations and users to track inventory more accurately. Know where each item is, who was responsible for getting it there, and who will be performing the next transaction. Have all your inventory item details readily available in a user-friendly format. Quickly filter through your complete inventory list to access the information you need when you need it. Perform frequent cycle counts through Clear Spider with ease. Data can be input at anytime from anywhere, ensuring system information is always accurate and up-to-date. We complete all necessary server maintenance and updates on our end so you don’t have to. This is all completed on the cloud, from our office, and with no system delay. 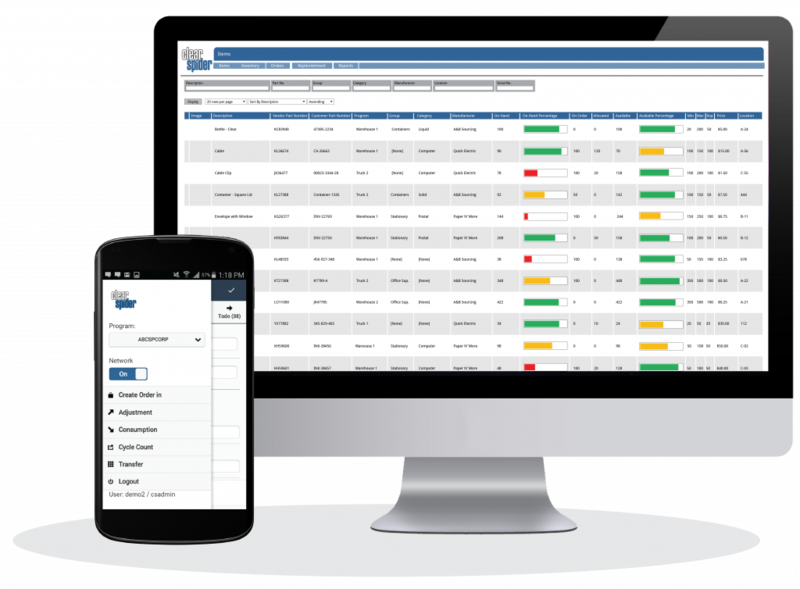 Don’t see everything you are looking for?Add additional functionality to our basic system to create the right solution for your organization. Processing orders separately for parts that are commonly sold together is difficult and slow. Kitting is an inventory management solution that can help increase your production efficiency. Barcode and RFID Inventory Management makes inventory control faster and more accurate. Tagging items helps keep track of your inventory, reduce errors and eliminate the cost of manual record keeping. Return Material Authorization is the process used to ship broken or defective items back to their originating point. With RMA you can easily manage and track items no matter who returns them. Managing your inventory is important, but managing your inventory when you have perishable items is crucial. Inventory lot control can protect your stock from expiring before your customers receive it. Serialized Inventory Management is one way you can effortlessly track individual items. Serial numbers create a record of each item’s product history so you can track inventory items with more detail and accuracy. Clear Spider has the ability to customize user permissions based on their role. Give access to the entire system or limit functionality to optimize efficiency and enhance security. Never have another late delivery with automatic replenishment. Set order minimums, maximums, reorder points, and lead times when the system is implemented. Clear Spider will generate orders when needed using those values. Onboard a limitless number of users so that your system can grow with your organization. Clear Spider makes this process hassle-free so that you can focus on furthering the success of your business. Our small business solution already includes a number of pre-set reports. If you don’t see what you are looking for we can create a custom report so you have all the insights your organization needs. Fill out the form below to schedule a demo and get more information about the Clear Spider Small Business Solution.